Before the launch this weekend of three human beings into the ether of space around the Earth, before they boarded their Soyuz spacecraft, and before the rockets were fired, precautions were taken. 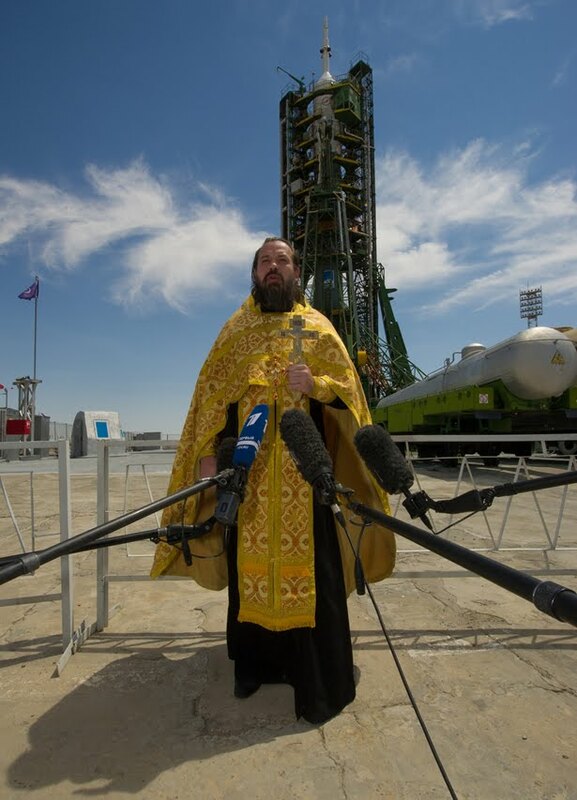 Not the humdrum checklists and redundancies of space exploration -- assessing the weather, the equipment, the math -- but a preparation with a more mystical dimension: the blessing, by a Russian Orthodox priest, of the spacecraft, as it sat on the launchpad on the Kazakh steppe. The scene, as shown in NASA photographs such as the one above, presents a tableau that seems incongruent, but may just be fitting. The discordance is obvious: Here we are, on the brink of a new expedition to space, a frontier of human exploration and research that is the capstone of our scientific achievement. "The idea of traveling to other celestial bodies reflects to the highest degree the independence and agility of the human mind. It lends ultimate dignity to man's technical and scientific endeavors," the rocket scientist Krafft Arnold Ehricke once said. "Above all, it touches on the philosophy of his very existence." His secular existence. And yet here is a priest, outfitted in the finery of a centuries-old church, shaking holy water over the engines, invoking God's protection for a journey to near-earth orbit. That these two spheres of human creation co-exist is remarkable. That they interact, space agencies courting the sanction of Russian Orthodox Christianity, is strange. For reasons both straightforward and opaque, the secular, scientific work of space exploration cannot shake religion, and over the last few decades of human space travel, astronauts of Christian, Jewish, and Muslim faith have taken their religious beliefs into orbit, praying out of duty, in awe, and for their safe return. Read the rest of this article, titled "Communion on the Moon: The Religious Experience in Space", here.